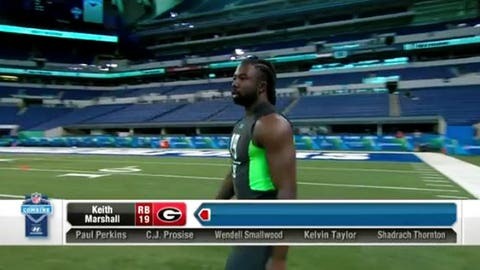 Former Georgia running back Keith Marshall clocked an official 40-yard dash time of 4.31 seconds at the NFL Combine on Friday, falling less than one-tenth of a second short of breaking Chris Johnson’s combine record of 4.24. Marshall might have actually eclipsed that record if he hadn’t been leaning too far forward, which caused him to stumble a few strides into his second sprint of the day. One of the knocks on Marshall was whether or not he’d be able to regain his speed after tearing his ACL in 2013. It looks like he was able to answer that question Friday.